I live real close to an H Mart, but the first ever H Mart that opened around this area is in Elkins Park. My family headed up that way to do some other shopping, and we stopped at the newish food court there to check it out. It’s called More Food Court and it’s actually pretty interesting. There are 6 food spots (i think) – vietnamese, korean fried chicken, chinese, traditional korean, japanese, and sushi (or something like that). 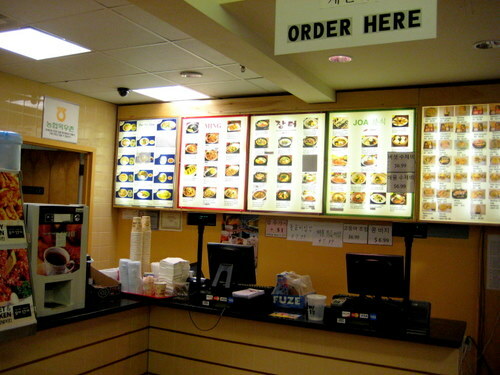 You order in one spot, and then you get a number, and when your number shows up, you go to the particular window to pick up your food. It’s all computerized and shizz. Fanciness. 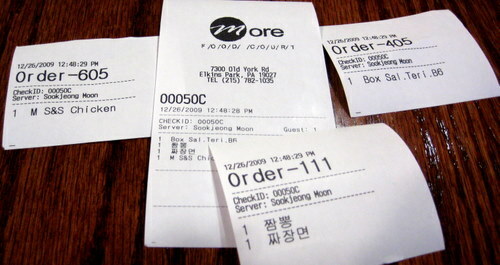 Your receipts have the order number. Then you go to your window when your number shows up on the numberboard overhead. It’s kind of brilliant actually. The food stations don’t need to worry about taking money, they just take care of making the food. My sis-in-law wanted to try some korean style fried chicken. 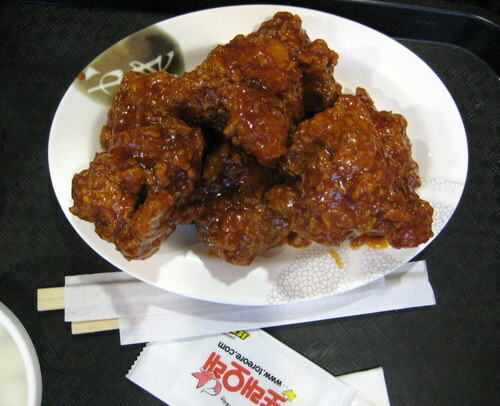 None of us were sure if this was indeed korean style fried chicken (really, what is it, exactly?) but it sure seemed like a possibility. So she got an order. It’s made to order, so this took the longest. She didn’t realize that it would be proper fried chicken that would need to be eaten with the hands. She didn’t want to make that much of an effort, so she didn’t end up eating it. She swapped her food with my bro, but my bro and I ate this. I liked it! 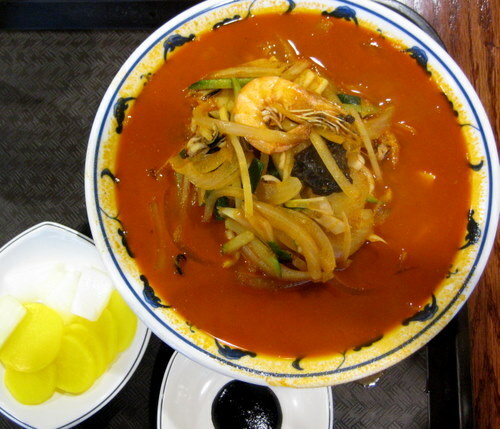 It’s hard to describe the taste, but it’s sweet and spicy and savory. The batter reminded me of the taste of tonkatsu batter. I would definitely eat this again, but I think it’s easier to order the boneless nugget version. We’re all so random. My mom got a salmon teriyaki bento box from the japanese outfit. 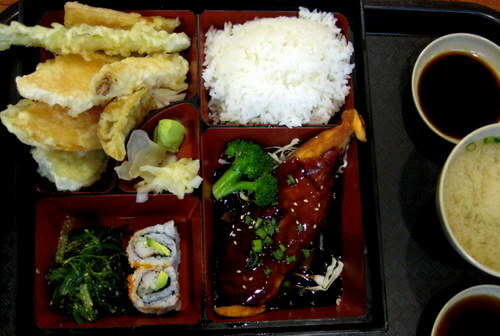 A nice piece of salmon, seaweed salad, a couple pieces of california roll, some veggie tempura, rice, and miso soup. Quite a bargain if you ask me. My brother got the chajangmyun, as is very typical for him. He got to eat some, before he was forced to give it up to his wife. And in the same way my bro always gets chajangmyun, I get jjamppong an awful lot. Sometimes, I can be very predictable. It always looks like red fiery death, but it’s not always super spicy. This one was spicy, but not overly so. It was a bit heavy on the veggies, but still good, with lots of seafood. I don’t know why I love this dish so much, I just do. I can eat this all the time! Happy to see your blog here, and it definitely puts me in an appetite.